Sign up at Golden Lion Casino on our site to be able use the promos and coupon codes listed below. Cashout Time: E-Wallets up to 10 working days, Credit/Debit Cards up to 10 working days, Bank Transfers up to 10 working days. Join the Golden Lion Casino pride and become a member of a fun and mighty online and mobile casino that is open to players all over the world, including the USA. Providing you with plenty of exciting gaming thrills from top online casino games developer, Rival Gaming, you'll have the chance to enjoy a diverse number of games include Rival's innovative I-Slots. Golden Lion is also a king of bonuses for both new and existing players. After starting off with a 100% up to 500 Welcome bonus, players can benefit from monthly bonuses, tournaments and more. Established in 2016, goldenlion.im is owned by Blue Media N.V. and holds a license in curacao. It is backed by SSL (secure socket layer) encryption technology and offers fair and responsible gameplay. Download, Flash (Instant Play) and a Golden Lion Casino Mobile offering for Android and iOS are available. Rival Gaming powers the games you'll find in this iGaming destination's library. Even though there is only one software provider, this doesn't mean that the casino lacks diversity. You'll find slots, table games, jackpot games, video poker and other specialty games like Bingo, Keno, Sudoku and so on. That being said, one of the true thrills is that among Golden Lion Casino games you will find I-Slots. Short for Interactive Slots, I-slots are special to Rival online casinos and provide a unique and fun online slots experience. These video slots feature a storyline and mini games are activated during bonus rounds. These elements help to keep the slot entertaining and fun with each spin. You'll find a number of top I-Slots at Golden Lion including Cirque Du Slots, A Switch in Time, As he Reels Turn 3, Fixer Upper and Bowled Over. When this Golden Lion Casino review was written there was no live casino offered. Become a member of Golden Lion and you can start your experience with a 100% up to $500 Welcome Bonus. This bonus isn't only awarded on your first deposit, but you can claim it on your second deposit, too! Be sure to use bonus code: LION500. Love the slots? If so, you might want to opt for the $750 Slots Bonus when you signup at Golden Lion Casino, instead. This bonus can be claimed with your first time deposit using bonus code: LION750. Plus, there's also a Free Chip no deposit bonus for first time players who want to give the casino a try and are lucky enough to find the special bonus codes online. Keep in mind that as is the case with the majority of online casinos, expect bonus terms and conditions to be attached to these promos. Want more rewards? 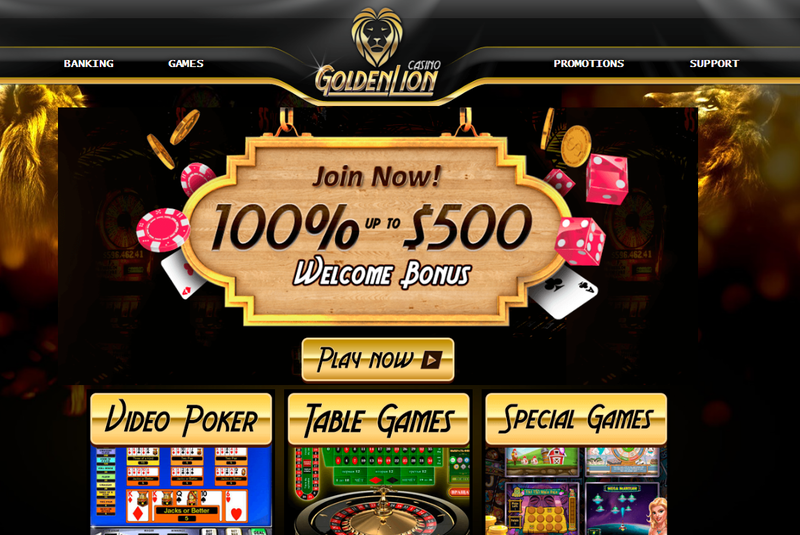 Golden Lion promises to deliver more with Monthly Bonuses, Slots Tournaments and a VIP rewards program. That said, if you want to become a VIP don't expect this status to be handed to you simply because you joined the casino. Get in touch with support if you would like to join the VIP club. There are several deposit and withdrawal banking solutions for both US players and players from around the world. Golden Lion Casino payment methods such as credit cards like MasterCard and Visa, popular eWallet methods like Skrill and Neteller. Although Golden Lion does accept multiple currencies, which is a plus, a couple drawbacks are long withdrawal processing times as well as notable withdrawal fees. Be sure to choose your banking options wisely. 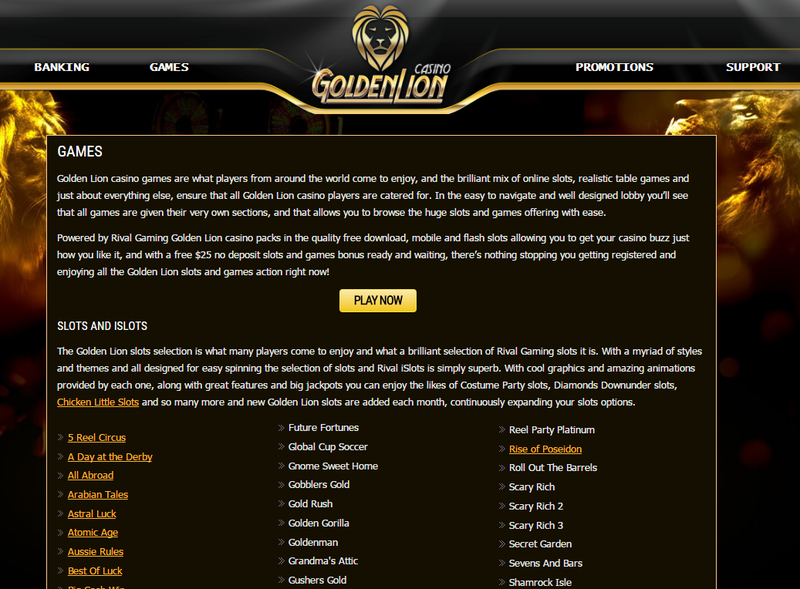 All Golden Lion Casino players can benefit from an FAQ and professional support 24 hours per day, 7 days a week. Regardless of the type of casino experience you prefer - desktop or mobile - the fully trained customer support will gladly assist you and provide email, live chat and telephone options. Golden Lion Casino has supported play on mobile platform, you just hold your smartphone at the image area to get the direct link to Golden Lion Casino on your mobile.